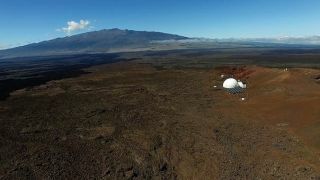 A view by drone of the HI-SEAS mission's dome, located at 8,200 feet (2,500 meters) on the Mauna Loa volcano in Hawaii. A crewmember of the mock Mars mission HI-SEAS (Hawaii Space Exploration Analog and Simulation) VI was admitted to the hospital yesterday morning (Feb. 19) after a minor accident, just a few days after the Hawaii-based simulation began. According to safety protocols, the three remaining crewmembers have left the dome habitat, and the eight-month mission will be put on hold until an inspection and investigation have been completed, representatives for the University of Hawaii at Manoa, which operates the NASA-funded mission, said in a statement. The injured crewmember was admitted to the Hilo Medical Center and was held for a few hours for observation, they added, but further medical information cannot be provided without the crewmember's permission. University of Hawaii spokesperson Dan Meisenzahl told the Honolulu Star-Advertiser that he was unsure how long it would take for the mission to resume and that more information may be available later in the week. "It's the first time this ever happened," Meisenzahl told the Star-Advertiser. The five previous HI-SEAS missions have studied international crews of four to eight living together in the dome, located at 8,200 feet (2,500 meters) on the Mauna Loa volcano in Hawaii. The missions have ranged from four months to a year, with crews living in isolation to test how humans would fare on long-duration planetary exploration missions. The HI-SEAS VI crew has members from Korea, Australia, Slovakia and Scotland.